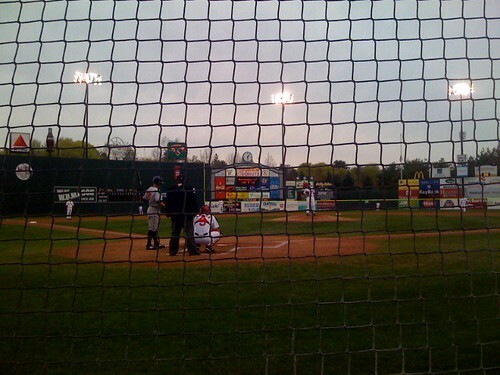 a $9 seat at hadlock, originally uploaded by sogrady. I haven’t. Well, actually, that’s not entirely true. I’ve been keeping up, I just haven’t been writing here to keep all of you up to date with said current events. But anyway, we’re back. And c’mon, three posts in two days? That has to count for something. While I can’t promise that we won’t have similar outages in future, I’d be surprised if we see another one of similar duration any time in the near future. Unless I’ll be moving half way across the country the week before JavaOne again and no one’s yet informed me. Anyhow, if all of the above has the ring of a half assed apology for the downtime, well, that’s just your imagination. I’m ready to get to the news on the heels of a much needed Sox sweep – bye, Brew Crew (especially you, Ryan Braun) – which followed a brutal four game depantsing at the hands of the Twins and O’s. This will doubtless come too late to stave off claims in some quarters – I’m looking at you, self-righteous sportswriters, pundits and analysts – that power is down because of the testing program, but this piece I found via Neyer is fascinating. I’ve always taken the “bats warm up with the weather” arguments with several liberal helpings of salt, but the correlation between weather and extra base power is difficult to refute. Food for thought, or ammunition the next time some ignorant talking head pops off. I’m with Chad: count me among those that is of the opinion that Bucky’s trip to the DL is little more than this year’s equivalent of Beckett’s downtime for the “avulsion.” Disabling him serves two purposes besides healing his wounded paw: first, it’s a mental health break for the starter followin two outings in which he didn’t make it into the fifth (both losses). Second, and more importantly, it’s an enforced period of rest during which he will not be accumulating innings. Rest worked for Beckett last year, and could and probably should work for Bucky this year. What will be interesting will be what role he comes back to: I’m increasingly convinced that he may be – Earl Weaver style (Keith Law would undoubtedly approve) – shunted back to the bullpen until Colon proves ineffective. One interesting bit of trivia: who’s got the second highest K/9 on the club? You guessed it: everyone’s favorite slim righthander. At 9.14, he’s behind only Pap, and ahead of Aardsma, Beckett, Delcarmen, Lester, Matsuzaka, Okakima, Hansen, Wake, and, well, you get the picture. That’s the good news. The bad? Righties are killing him to the tune of a .908 OPS. As the Boston Globe was kind enough to inform us, Portland’s own Justin Masterson will be getting his second big league start this Tuesday. Which is curious, because as previously noted in this space, Masterson hasn’t exactly been lighting it up. It’s not every day that you give up 7 earned in a start and earn a promotion to the big club. But desperate times and all, he’s the guy. And I suppose it’s worth noting that he did pitch very effectively in his previous outing against a talented Angels club (which featured another impossible Okajima outing: bases loaded, no one out). Manager Terry Francona, acknowledging that Masterson has been cuffed around in his last few starts for Double A Portland, said the pitcher’s mistake has been leaving balls up in the zone late in games. I’m not entirely convinced this is a good move, as I’m not sure the majors are where a pitcher learns to get the ball down, but then I don’t have to be convinced, because no one cares what I think. Not only are the Rays in first place, they’re in first place on merit, as their +25 run differential is slightly better than that of the Red Sox (+23). Everybody else in the division — Orioles (-7), Blue Jays (-1) and Yankees (-6) — is bunched up around .500, exactly where they should be. That Youk is tearing the cover off of the ball at the moment, you probably knew. That he leads all Sox regulars in OBP, SLG, doubles, total bases and lags Papi in home runs by 1, you might have known. What you probably didn’t was why. Fortunately, Inside Edge has you covered. First, Youk is flat out destroying lefties (.444/.538/.889 for an absurd 1.427 OPS). Against lefties, he’s effectively Barry Bonds circa 2004. Which makes a difference. 2008 .333 .563The scouting service believes the above augurs well for his ability to sustain some level of the performance we’ve seen to date going forward. I hope they’re right. As for the obligatory Crisp rumors, comes the following, via MLB Trade Rumors via Ken Rosenthal: it may make more sense to hang on to Crisp. Apparently the free agent center field class for ’09 – unlike this past offseason – is weak, meaning that retaining him for the duration might be the preferred approach. While I still would entertain trade offers if it might improve the bullpen, particularly with Moss on the mend, his speed and defense do look good on the roster. Particularly the bench. Courtesy of the aforementioned Chad Finn, did you know that Tito was one of Sports Illustrated’s “Faces in the Crowd?” Me neither.